Do you need assistance basically, information about how you could choose a suitable DSL package for your business or even for home? Well, this article is for you. 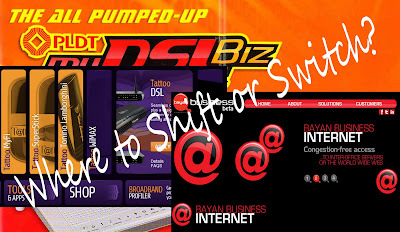 I just come up creating the tables below to give you some options and idea of what are the services made available or offered by our country’s leading Internet Service Provider (ISP) these are PLDT, GLobeDSL and BayanDSL. Wireless Broadband services are not included here. However,I add some links to help you browse additional details. I patiently get the info from my friends working on the different ISP companies. For more info about Globe DSL packages check their page. See also the Wireless Broadband Internet powered by Globe page. WiFi modems on most plans-Globe ProLink is also offered. For more updates, you check the PLDT myDSL page. · The previous offers was upgraded from .5 to 1 mbps of bandwidth each plan. For example, the Small Biz lite has a 3.5 mbps of speed now it comes with 4 mbps. · Every subscription is entitled to have the new PLDT Versatile Biz Box- a new all-in-one networking hardware could function as modem and switch which allows you to connect your local network with 2 Ethernet and USB ports. The Bix Boz is also a wireless router your office a Wi-Fi zone. This is only available to the new subscribers. · 2 years lock-in period. Prefer for wireless internet, check the PLDT Broadband Solutions page. If you need wireless, see their Bayan Broadband page. The SME and corporate plan requires a package or installation fee of 1,999 pesos. The SME package is also a best option for your business to save from monthly service fee (MSF) and a range of bandwidth choices like the corporate plan. Do I miss something? Please put your feedbacks below and let’s discuss!